Using the deeply incongruous history of Iran as a framing device, A Rain of Light and Death assembles a selection of works by Iranian artists from a range of generations and backgrounds. If a framing device both excludes specific ideas while focusing attention on others, each of the works shown in A Rain of Light and Death follow a similar imperative. Perhaps the only conceptual through-line of the presentation is heterogeneity itself: the exhibition brings together highly-varied works, scattered over generations and geographies, in order to reveal the numerous divisions and conflicts throughout their authors’ origins. Without recourse to a unified, collective consciousness, each of these artists—like each Iranian—carry a unique, densely stratified, often conflicted conception of home. Rather than attempting to forge a linear narrative or unified image of their authors’ cultural origins, the works exhibited in A Rain of Light and Death seeks to manifest the conditions of social and political strife endemic to the history of Iran. Each work indicates both a hope for the future—a brilliant light at the end of a long, dark tunnel—and, conversely, a sense of despair, as a seemingly inescapable cycle of destruction appears to advance toward a destructive terminus. Themselves existing as fragments of a location and zeitgeist beset by cataclysm, the works collectively embody the brokenness of the histories to which they belong. Descending earthward from the fraught realm of the Angel of History, their images surround us, dispersed yet immersive, like a rain of light and death. 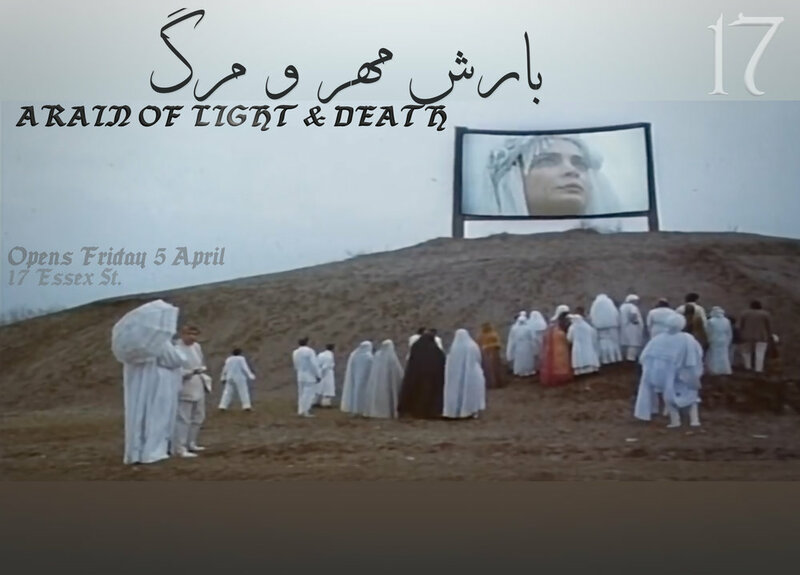 A Rain of Light and Death constitutes the first group exhibition at 17Essex, and is dedicated to the people of Iran and their multiple histories. Artists exhibited: Sadaf H. Nava, Shirin Neshat, Sahra Motalebi, Borna Sammak, Pooneh Maghazehe, Raha Raissnia, Sara Dehghan, Setareh Shahbazi, Amin Akbari, Afruz Amighi, Bahar Sabzevari, Sareh Imani, Yasi Alipour, Atieh Sohrabi, Farshid Shafiey, Nicky Nodjoumi, Ali Chitsaz, Alex Zandi.